Yeah, we know you’ve heard the saying before, but really – how much is your head worth? 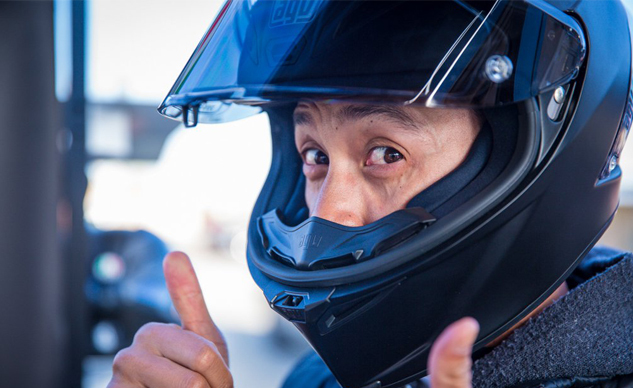 Ask us and we’ll tell you we want to wear the best motorcycle helmet money can buy. Your head really is the most important thing to keep safe, whether you’re on a motorcycle or not. We know this seems like an obvious statement, but it’s worth mentioning again, especially if you live in a state without a helmet law. Here, we bring you some of the best helmets money can buy – including some modular options for street riders or those who like the versatility flip-ups provide. Presented in alphabetical order, the MO staff collectively agree the helmets below have brought the helmet game forward in terms of safety, comfort, design, practicality, or all of the above. For decades helmet construction was basically the same: a polystyrene shell surrounded your dome and was built to crush upon impact, absorbing the crash force so your head won’t have to. But as motorcycles evolved, helmets didn’t. Until 6D arrived. It’s ATS-1 helmet, like the rest of 6D’s helmets, employs its ODS (Omni-Directional Suspension) technology to reduce energy transfer to the head/brain during impact much more so than traditional helmets. Basically tiny springs wedged between two EPS liners, 6D has changed the way we look at helmet design. More info can be found in Tom Roderick’s review of the ATS-1 and on 6D’s website. Sure, you could spring for the $1399.95 Pista R (or $1599.95 if you want the Rossi replica), but that helmet is purely for racers, with a couple niceties you won’t find on the Corsa R. Otherwise, the Corsa R is a no-compromise street/track helmet that could easily be a permanent fixture on a racer’s shelf. A highly aerodynamic design is available in four shell sizes for a better fit for the end user. The Corsa R also features a reversible crown pad, 0.5mm thick visor with Pinlock inserts, and an extremely wide field of vision. Read more about the Corsa R in our full review. To learn more, visit the AGV website. We’re still in the process of testing AGV’s new SportModular helmet, but despite the fact a full review isn’t up yet, we feel this helmet should be included in the conversation. Weighing in at just a touch over 3.0lbs, the SportModular is built entirely from Carbon Fiber. AGV says this flip-up meets the same safety standards as its Pista R MotoGP helmet – while weighing less than its racing counterpart! Built for the sport and sport-touring rider, AGV says it spent countless hours in the wind tunnel to make the SportModular aerodynamic and quiet, while still providing good ventilation and stability. So far, our testing tends to agree with AGV’s claims. We’ll have a full review soon, but for more information visit the AGV website. Arai’s reputation is second to none when it comes to helmet safety, and the Corsair-X is the crown jewel in the Arai lineup. The same helmet the racers wear on MotoGP and WSBK grids, the Corsair-X represents the best Arai has to offer – though from a safety standpoint, each full-face Arai, no matter the model, meets the same internal safety standards, which surpass both DOT and Snell. Each Arai is handmade by an expert craftsman in Japan and is built around the R75 shape. 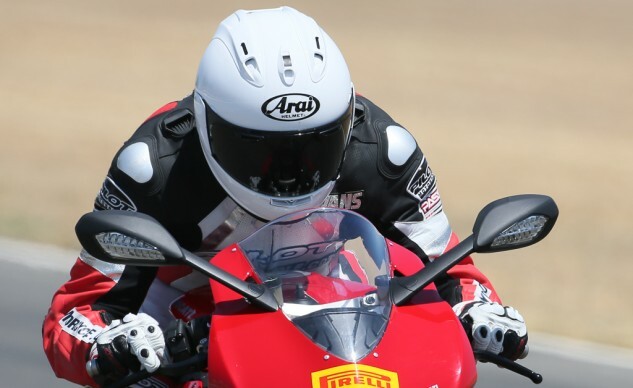 That is, each Arai incorporates a continuous curve radius of at least 75mm. This shape, according to Arai, ensures optimum dispersal of energy in a crash, while also negating the chance of the helmet catching onto a sharp object or obstacle while tumbling. What sets the Corsair-X apart from the rest of the Arai line is the extreme amount of ventilation found throughout, allowing a racer to stay cooler, longer – which is vital for concentration during a race. Learn more at Arai.com. Read our review of the Corsair-X. Back in the day, the Bell Star was the helmet to put on your head because it was the only helmet to put on your head. Fast forward a few decades and Bell’s new flagship is the Pro Star Flex. Bell’s lightest and most advanced helmet, the Pro Star Flex features a carbon fiber shell reinforced with Textreme, a lighter, thinner carbon fiber fabric. Helping protect your noggin from impact forces, the Flex design incorporates three different layers of material at different densities – EPO, EPP, and EPS – to best absorb impact from low-, mid-, and high-speed crashes. From there, magnetic cheek pads, a huge field of view, especially when in the tuck position, a sweat-wicking liner, and excellent ventilation all contribute to the helmet’s premium feel. Go to the Bell site to learn more. 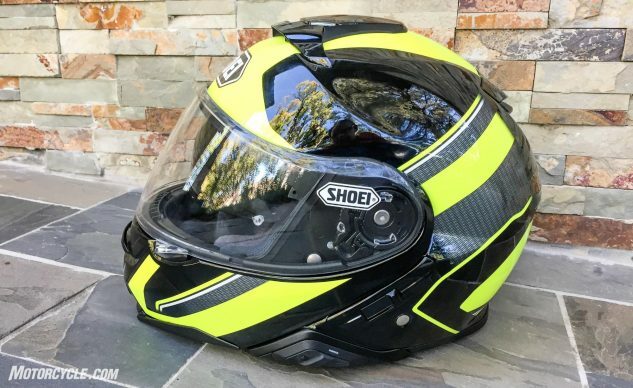 Our own Evans Brasfield just finished reviewing the Bell SRT-M, and liked it enough he felt it a worthy inclusion in this list of best motorcycle helmets. 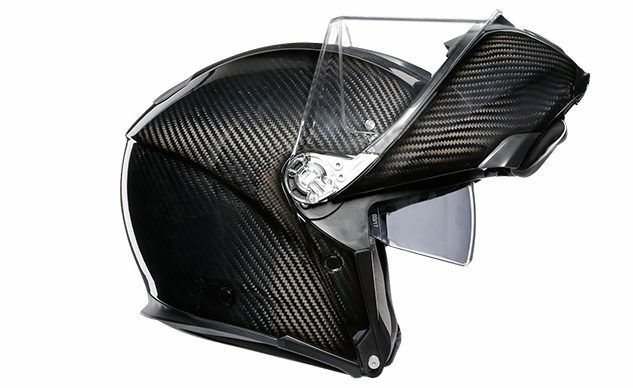 Bell’s premium modular helmet, you can tell a lot of thought went into the design of the SRT-M. From its aerodynamic shape, to the vents, even down to the shape of the internal flip-down sun visor and its lip extension that helps block turbulent air from coming underneath the chin bar and aggravating your eyes. 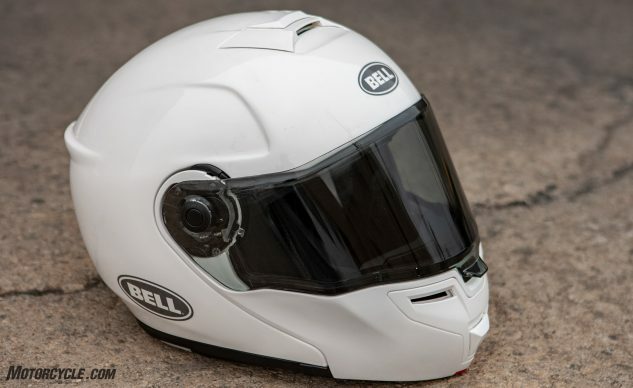 With correctly placed grooves for glasses and pockets for communication systems, Bell’s SRT-M has really thought of everything when it comes to the practical street helmet. To learn more, go to the Bell website. RPHA represents the top of the line when it comes to HJC, and the RPHA 11 Pro is the top offering in terms of full-face race helmets from the Korean helmet manufacturer. Lately, HJC is getting notoriety for the wacky graphic designs it’s place on its helmets, a result of the partnerships it has formed with the Marvel, Disney/Star Wars, and Pixar franchises. But to focus on that would be to miss an excellent helmet in the RPHA 11 Pro. Constructed from composite materials, the 11 Pro is a surprisingly comfortable helmet with great aerodynamics and ventilation. The RPHA 11 Pro has a lot of the premium features as the others but comes in at a price point much easier to swallow. Learn more at the HJC website or by reading John Burns’ review. When it comes to a fully-featured street helmet, the Shoei RF name is legendary. With the RF1200, the legend continues. Featuring a slimmer profile compared to its RF1100 predecessor, the RF1200 is also more aerodynamic. Constructed from a six-ply matrix of various fiberglass and organic resin fibers, the RF1200’s dual-layer EPS liner incorporates different densities while also allowing cool air to travel through built-in channels. In all, the RF1200 meshes the extreme comfort we know and love from Shoei with excellent protection, visibility, and ventilation. Read our review of the RF1200 or learn more at the Shoei website. In case you haven’t noticed by now, the MO staff loves flip-up helmets. They’re practical and convenient – basically everything we want in an everyday street helmet. The field is stacked with great modular helmets (and a couple not-so-great ones), but one of the best we’ve tried is the Neotec II. Several tweaks were made in the wind tunnel to improve the Neotec II over its predecessor, resulting in a modular that’s more aerodynamic, quieter, and comes with improved ventilation. A trifecta of achievements, especially considering the original Neotec was no slouch in any of those departments. For the full scoop on the Neotec II, check out Evans’ review here. Or visit the Shoei website. 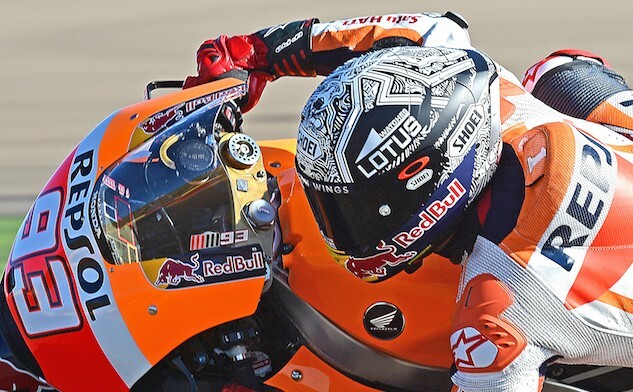 If you want to wear what’s on Marc Marquez’s head, then the X-Fourteen from Shoei is it. The best of the best, the X-Fourteen competes with any other flagship racing helmet out there. With the help of wind tunnel testing, the X-Fourteen is the most aerodynamic X-series model to date, with removable and/or replaceable wings to suit the rider’s needs to a specific track. The wind tunnel also helped with ventilation design, as the six intake ports work in tandem with the six exhaust ports for excellent airflow. There are even ventilation channels designed around the cheek pads to cool the rider in that area. Comfort is a given with the X-Fourteen, as one of the four shell sizes are sure to fit most head shapes, and the patent-pending rotating liner system allows for a better field of vision in a tuck position. Dual-layer, dual-density EPS liner disperses impact energy with the best of them, and the quick-release cheek pads (seen on all Shoei helmets) makes it easier for first responders to take off the helmet if they need to tend to you. Learn more at Shoei.com. Read our review.